Knowing your child’s blood sugar level at all times is essential to your peace of mind, but we know this can be especially challenging at nighttime. Now, help has arrived. 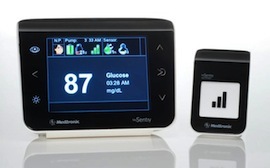 Medtronic recently launched the mySentry™ Remote Glucose Monitor, a first-of-its-kind remote glucose monitor which allows a parent or caregiver to monitor the MiniMed Paradigm® REAL-Time Revel™ System – integrated insulin pump therapy and continuous glucose monitoring (CGM) – from another room. mySentry™ allows parents and caregivers to see their child’s real-time glucose information and hear alarms from their bedside while their child sleeps in his/her own room. For example, parents can hear an alarm if glucose levels fall, which may allow them to take the action necessary to prevent hypoglycemia. Now you can rest easy with mySentry™! To learn more about mySentry and important safety information, visit: www.medtronicdiabetes.com/mySentry or call 1.800.646.4633(select option 3) to speak with a Medtronic representative.